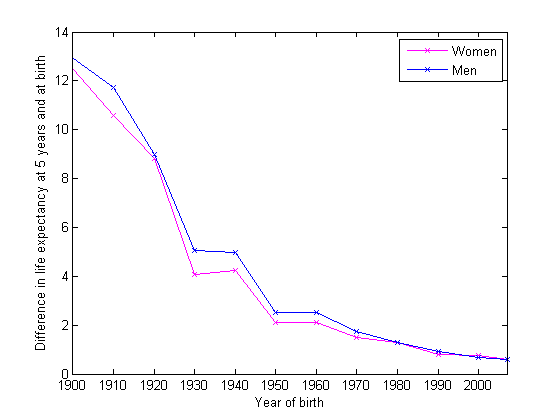 (1) Women have been outliving men for a long time. I thought this was a relatively new phenomenon. It isn’t. 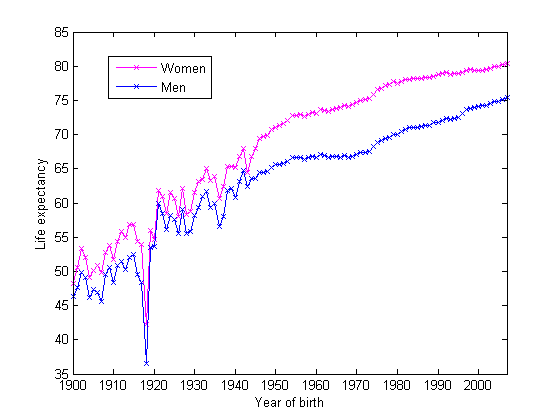 Women had a better life expectancy than men at all ages as far back as 1850 (and perhaps longer–I don’t have the data). This is shocking. I thought the risk of childbirth and unsanitary conditions during childbirth would have significantly shortened women’s lives up until the early 1920s. I guess I was wrong. (2) That blip in life expectancy occurred in 1918. My educated guess is that Spanish influenza caused the blip, since the flu disproportionately affects infants. This is incredibly sad. (3) There are many blips before about 1945, and life expectancies have looked smoother ever since. I would guess that the widespread use of childhood immunizations has greatly reduced the outbreaks of disease that periodically occur. These diseases are often fatal for infants. The first flu vaccine was introduced in 1945. Many others were introduced near that time (see this timeline and this CDC timeline). This figure is life expectancy at birth. The infant mortality rate plummeted over the course of the 20th century, meaning that much of the improvement in life expectancy is merely caused by a drop in infant mortality. Below, I plotted the life expectancy at age 5 according to the year of birth. (1) Here, you can see how the life expectancy is much higher at age 5 than at birth for those birth near 1900, even when not accounting for the first five years of life that went by. This underscores the seriousness of infant mortality at the time. There are few differences between the life expectancy at birth and at age 5 for those born after the year 2000, and in general, the life expectancy curves are flatter than those at birth. The smoothness may be due to each of the points being a moving average rather than “proof” that the lack of smoothness in the first graph was caused by childhood diseases (which is what I suspect). (2) The disparity between women and men has increased over time. It looks like the disparity has been reduced somewhat in the past 20 years, but the difference between men and women now is much greater than it was in 1900. Married men live longer. Could the life expectancy rates be less disparate if more people were married? I don’t have data to answer that question. To plot how much of the increase in life expectancy is caused by improvements in infant mortality, below I plotted the difference in the life expectancy at age 5 and at birth. I normalized these life expectancies by five years to compare apples to apples. Boys and girls born in 1900 and who survived infancy would live 12.9 and 12.5 years longer than their life expectancies at birth, respectively. Interestingly, boys have been disproportionately affected by infant mortality over the years by a small margin, and the figure below reflects this. If you know why, please leave a comment. This entry was posted on Thursday, January 26th, 2012 at 3:37 pm	and posted in Uncategorized. You can follow any responses to this entry through the RSS 2.0 feed. « Who will be the Republican nominee? And Hans Rosling has plotted the data without gender differentiation from 1800 to date for several countries in gapminder. Once upon a time, I used to teach about age-specific failure rates and failure functions which led into the “Bathtub curve”. In the UK, age-specific death rates for humans are fairly constant from 5 to 50 — except for males aged 17 to 25, where the rate increases due to deaths in road accidents. Is it the same in the US? Since 1980, the difference of life expectancy at 5 vs birth is about 1 year, while men’s life expectancy has grown by 5-6 years. This indicates that infant mortality has a limited impact nowadays. In the same period, women’s life expectancy increased about twice slower…could that tell us that medical progress cures more diseases, and that men have been more exposed to disease related deaths compared to women who have been more subject to “natural” deaths…? Girl babies have a stronger immune system while boys are much more likely to be born prematurely and to suffer from respiratory problems. Boys are also more likely to cause risky or difficult labor because of their larger body and head size. Apparently nature knows this too because a couple extra boys are born for every 100 girls. But their numbers even out after a few years. Sorry, if this is too much off-topic, but in the remote case you haven’t seen it, I need to link to Hans Rosling’s BBC-improved TED talk on life expectancy. It seems to me that the widening gender gap from 1920 onwards tends to support your notions about childbirth reducing female life expectancy. Perhaps the effect is not as significant as you thought, but it looks like it is indeed there. All: These comments are amazing. Thank you for your references and insight. I will work on a follow-up post as soon as I can find the time. 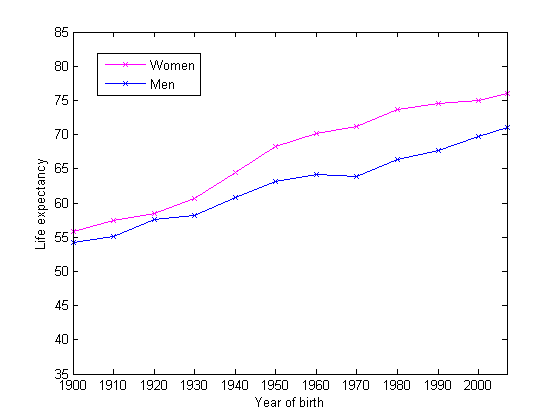 I wonder why the male line levels out between 1950 and 1970 while the female line continues to climb (and widen the gap). The divergence between the sexes seems to have happened mostly in the late 1940s. Baby boom years in both cases.